1. a nine month old who MUST be teething, because he keeps me up many many evenings and nights, and has done now for the better part of 2 months on and off. Not a tooth in sight however. 2. I have just finished managing the Mini Wardrobe Contest on PatternReview.com. It was purely voluntary, and hard work. It was my second contest, but far more intense than the first one I managed (One Fabric: Wool in late 2009). I enjoyed it for the most part, even though I am glad it is over and I have my days somewhat back to myself. 3. I don't know where my time and my life goes, between 3 children full time (none in daycare/ with extended family), 1 part-time, a husband who is studying and working, and me, also working and being a full time mum. We are among the busiest people I know. Sigh. 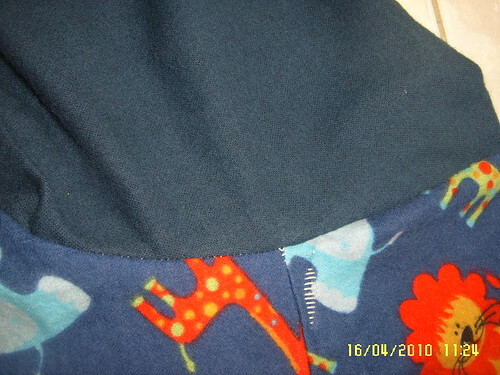 trace, cut out and begin to sew Simplicity 2815, which is an OOP pattern for kids' PJs. I made a size S, intended for a 7 year old boy, my husband's son. I used material entirely from stash (new determination to use up stash before I buy ANY MORE fabric), so ended up running out of the 2m of fabric that I had, given to me by a friend, and making up the balance in a navy flannelette. All up, it took me 5 hours to make these, from tracing through to sewing. A bit slow perhaps, but welcome stress relief! I hope he likes them. 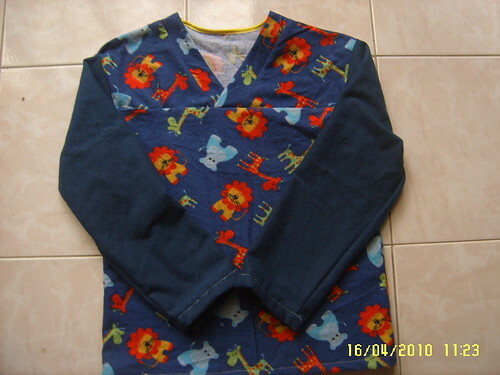 This is the top, long sleeved, in Size S, with colour blocking. I used material entirely out of stash, and ran out of the animal print flannel, and used flannel in navy to make up the rest. This was my first top using a yoke, and making a V nect, and I am pretty pleased with the result. 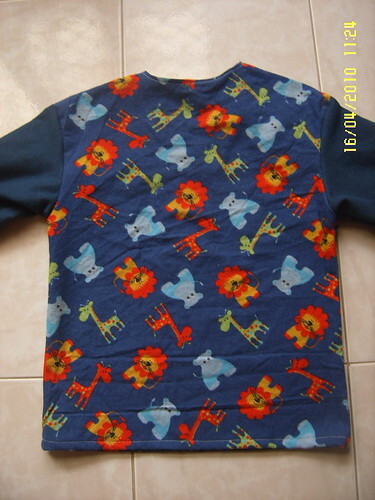 I had tried to use this pattern to make my eldest daughter (4 years old) summer PJs in january, but it was left to the side because the smallest size, XS, was too large on her, and the instructions threw me, so that the bias binding on the back neck was a mess. This time around, I disregarded Simplicity's instructions and bound the neck edge BEFORE the shoulder seams, which worked much better, as you can see above. Sleeve set in in the flat, another first for me. Rather nice, if you disregard the annoying overlocking showing to the side. I did not have thread in a matching colour, so I used contrasting thread in cream to do all my construction. Elastic pants, another first for me, and neat, even hems, ditto. 2. 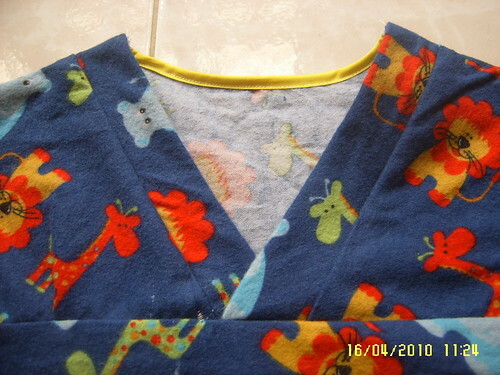 Inserting bias binding to neck backs neatly, by disregarding Simplicity's instructions! 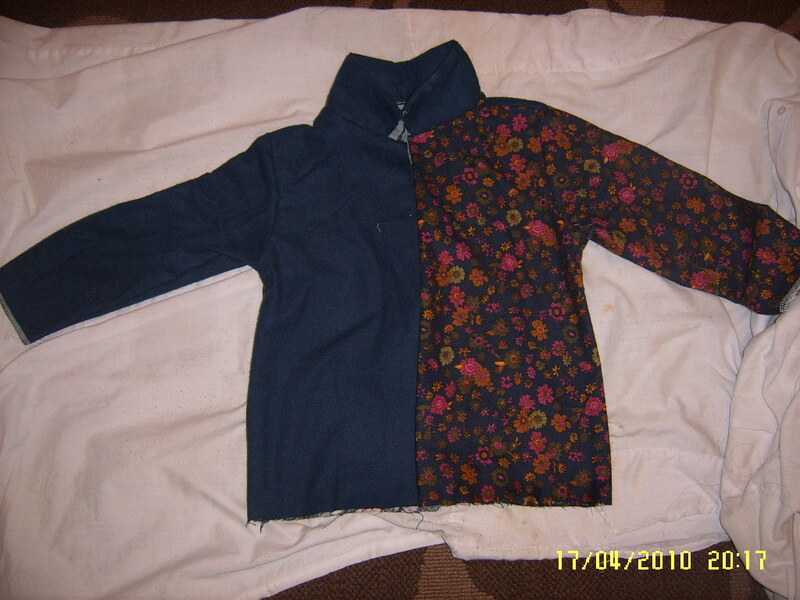 3. setting in sleeve in the flat. All up, I am pretty pleased, and I hope he likes them. My husband thinks he will. 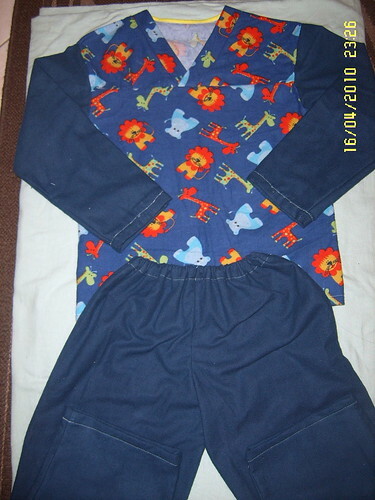 Kwik Sew 3126- Toddler's PJs, T1-T4. I am making the T4 for my eldest. Struggling so far, with the collar and the instructions. It is a good fit on her, and she really likes the unusual colour blocking. I'm not happy about the collar at all, and other bits, but more on that when it is all done. I am working all day tomorrow, 12 hour shift, and so will be gone some 14 hours, so no sewing till monday, insha'Allah. It feels so good to be sewing again, and even better to have learnt some new techniques.